Are there any Cheats for Battlelands Royale? Yes, there are a whole bunch of different ways and techniques of gaining an unfair advantage in this action mobile shooter game: Mods and Mod Menus can be used to activate hacks in the game itself on Android and iOS devices alike, aimbots can be used to automatically aim for you, wallhacks will show you hidden players, their health and much more. However, there are no cheats for unlimited Battle Bucks / Coins and free skins, since this is an online mobile game and your account data is stored on the Futureplay (developers) game servers that cannot be modded or hacked using any means. Modified games for iOS and Android are the most sought-after way of cheating in this game. This mostly because mods are extremely easy to download and install on most devices with no root and no jailbreak required in most cases. A mod is a version of the actual Battlelands Royale game that has been reverse-engineered and recoded or compiled to give the player cheating options and functionality right out of the box after downloading and installing the game app. 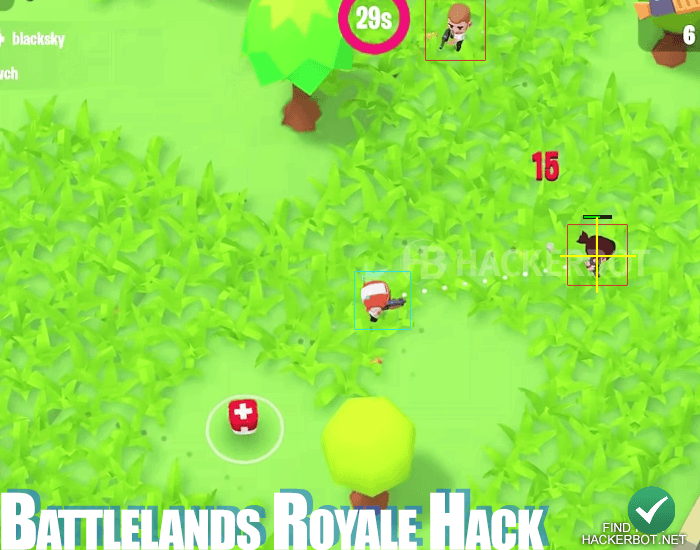 These modded or hacked versions of Battlelands Royale can include cheats such as aimbots, wallhacks, fast shooting, no reload, fast ammo and shield/armor pickup, shield hacks, firing through walls, no spread on shotguns and many more kinds of cheats may be included in Battlelands mod menus. The only real downside about Battlelands hacks is that they are hard to find, since every time the game receives an update, the build of the hack has to be updated and not many free downloads are on time with their updated. Use our cheat finder tools to find mods. An aimbot is a script or automated process integrated into the game by either code injection or modding that automatically aims and shoots your guns for you to do maximum damage. 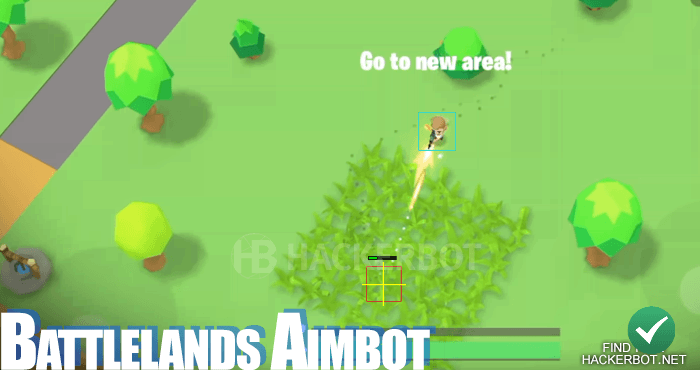 Aimbots are also able to detect and shoot players that are hidden in bushes and grass automatically. Some aimbots for Battlelands Royale may include triggerbot functionality to automatically shoot on top of locking onto enemies. 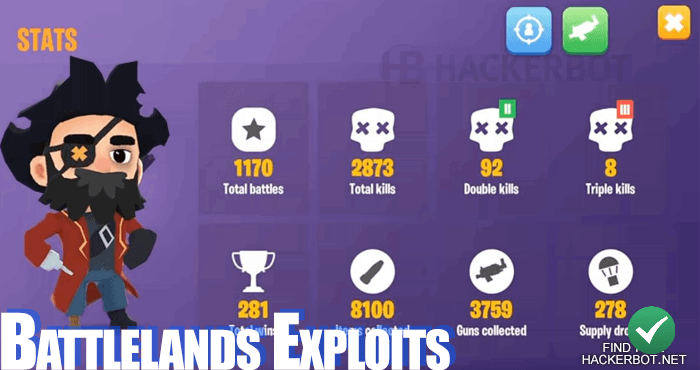 As would be expected this way of gaining an unfair advantage will get you lots of kills, lots of wins and will allow you to farm free Battle Bucks (coins), XP and level unlocks and Legendary skins a lot faster. However, auto aiming software for mobile shooter games on Android and iOS are extremely rare and finding a mod menu that includes an aimbot will be quite the challenge. It is also recommended that you never use auto aiming bots for too long at a time, since you will get reported and your account is likely to get banned from Battlelands Roylae if you do not use this kind of app with care and respect for the other players of the game. If you cannot find any working downloads for the current game versions of Battlalands, you can always try to use some of the best game hacking tools for Android and iOS on the game. However, you must do so using an alt account or you will risk a ban as soon as you connect the apps to the game. Visual Assistance Cheats (VAC) or ESP cheats allow you to see information that would usually be invisible to you: Enemy health, enemy shield, enemy ammo, hidden enemies in bushes and tall grass, enemy equipment, where they aim, how much ammo they have left, where a bazooka is going to hit, how far their guns can reach and so on. The most useful feature here is that Wallhacks can make it extremely easy to kill players that are camping in bushes and tall grass using shotguns. All you need in an AR or Sniper and you are able to take them out for basically free, netting you some good kills and allowing you to place more highly in any round of battle royale in this game. Downloading these cheats, you should always follow our guidelines on how to identify which files are undetected and working to avoid any potential bans. There are sadly no generators, tools or hacks that will allow you to get unlimited battle coins, skins and unlocks. God Mode cheats are also impossible in Battlelands. Why? – Well, because this online multiplayer shooter is, as you may expect, an online mobile game. That means that all your account information and data, including your money, your unlocks and your health , are stored and processed on the online servers belonging to Futureplay. Such online servers cannot be hacked, modded or changed in any way by anyone that is not a game admin or developer. 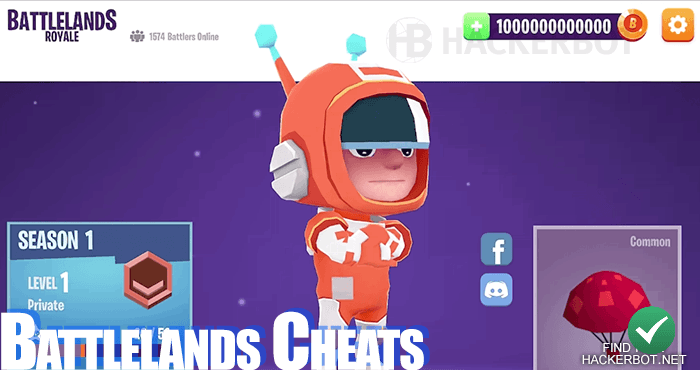 While there may be people claiming to be able to offer you Free Battle Coin generators and similarly impossible cheats, these are all scams and will most likely try to get you to fill in human verification surveys, then leave you with no downloads, not cheats and no working generator for Battlelands Royale.